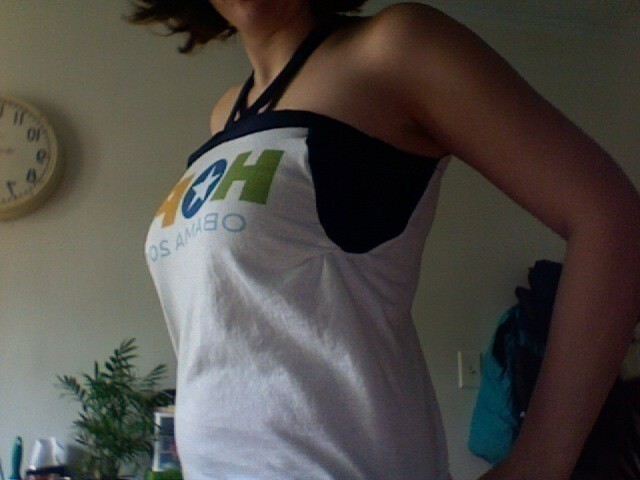 I got this shirt when Obama first announced his candidacy for the president, but when I got it from cafepress it was way too big and didn't fit well in my chest area so I decided to do something with it. 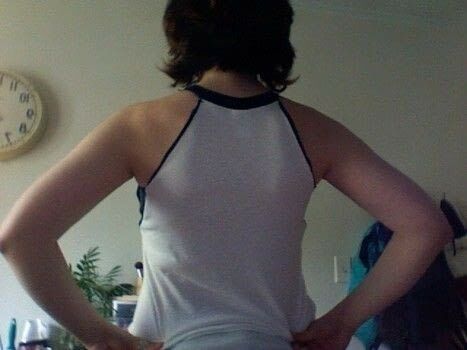 Cut off the sleeves of the baseball T and set aside. 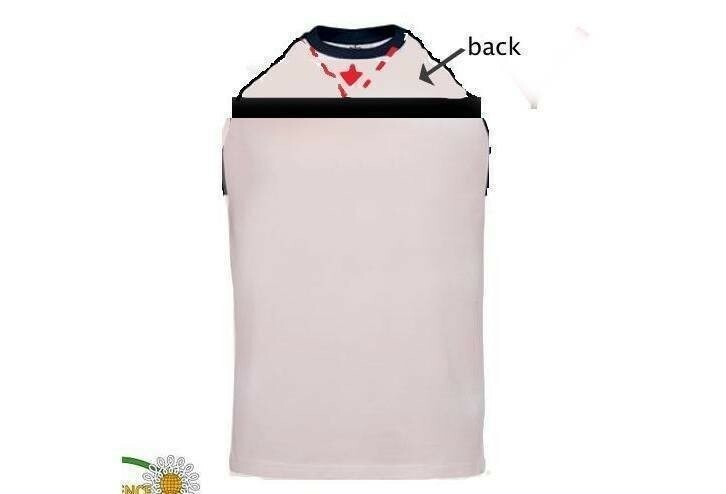 Cut the front of the T just above the chest (do NOT cut the back) where I have marked in red. Measure the width of the front where you have just cut, and cut a piece from the sleeve that is the same length. This will be the band at the top of the shirt that connects to the halter piece, so it should be double the width you would like it to be. Hem both sides of the piece you've cut from the sleeve, and pin it to the top of the front of the T. Sew using a straight stitch. 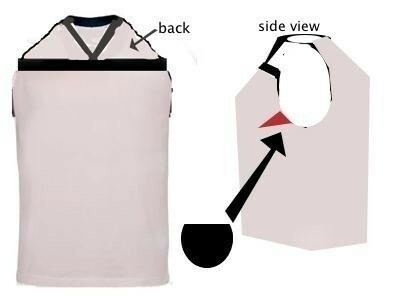 Now pull down the collar that is still attached to the back of the shirt to the top band. Fold it so it forms a V and pin it in place for now. Open the shirt up so that you can see each side as shown on the right. Cut pieces from each sleeve (or use an additional material) that fit a semi-circle under the arms. The pieces should be serged (or use zig zag stitch) to prevent fraying, folded over at the top, and attached so that they are even with the top band. Once the side pieces have been pinned in place, sew a top stich all the way around from one underarm to the other, securing the folded over under arm pieces as well as attaching the V to the top of the band. OMG! 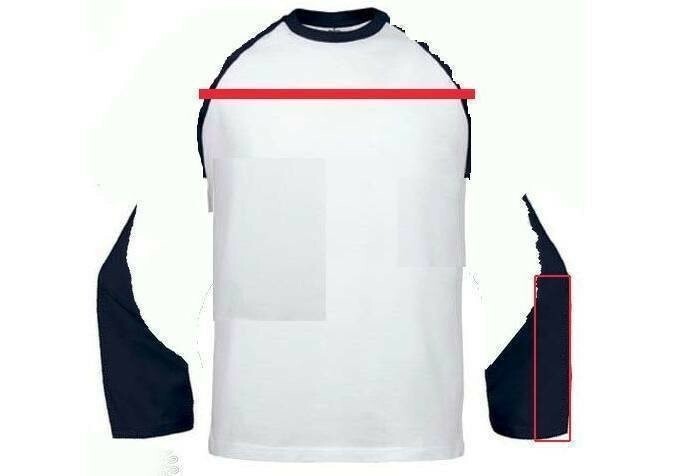 I have lots of ideas for my baseball tees! hey jo, im new to dis site, but signed up just so tat i cud tell u that i loved ur idea...keep up at it n post some more such fab cut-creativity....thanx..